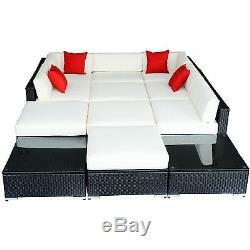 12pc Rattan Wicker Sofa Set (Color: Dark Coffee, Cream & Red). 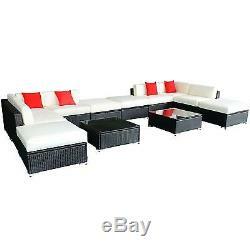 This stylish Rattan Sofa Set comprises of 10 sofas, 2 tables, cushions and throw pillows. Our sofas are amply padded, stable and the cushions are designed to be breathable. Perfect for the patio, deck or poolside, these cushioned seats will invite you and your guests to sit back, relax and enjoy the great outdoors. The 12 pcs are infinitely reconfigurable, allowing you to rearrange whenever you need too or even just when the mood strikes. The cushions have removable covers for easy cleaning, but they also allow you to change the color of the cushions creating a whole new look and feel for your patio. These sets are simple to clean and built to last with minimal upkeep needed. With a strong aluminum frame and gorgeous all weather PE wicker, this sofa set is the one you are looking for. Please note the Cushions are water resistant but are not water proof. Recommend covering or storing during adverse weather to prevent any weather damage to the product. Perfect for the patio, deck or poolside. Excellent hand-weaving technique with fashion design. 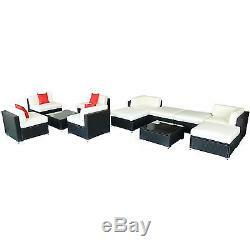 Sectional wicker sofa set, light, strong, and easy to assemble. Modular design of this sofa set enables flexibility with many configuration options. 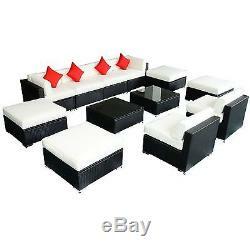 This set allows you to change the display methods of the sofas creating a whole new look and feel for your patio. Rust resistant aluminum Frame and PE rattan. 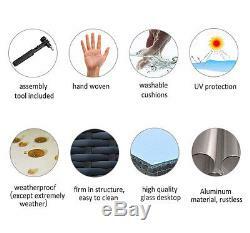 Cushions: Water proof fabric and stuffed with durable sponge. Quality cushions with removable, fade-resistant covers. Includes beautiful red throw pillow come with zipper for easy cleaning. 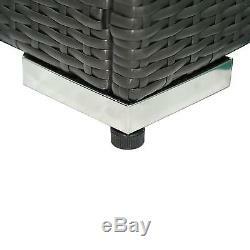 "L"shape Metal footing pad can adjust the balance of the sofa when you put the sofa on the rough ground. Rattan Color: Dark Coffee & Cream. Armless Chair (overall) : 31 1/2" W x 31 1/2" D x 25 1/2 H. End Chair (overall): 31 1/2" d x 31 1/2" w x 13" h (wicker only) (19" h w/ cushion). Coffee Table 31 1/2" w x 31 1/2" d x 11 h. Red Throw Pillow: 15" x 15". 2 x Coffee Table with 0.2 / 5 mm Tempered glass top. 4 x Red Throw Pillows. 18 x cushions(10 seat cushions, 8 back cushions). We are committed to offering our customers value-oriented items in the Sports & Fitness, outdoors categories. We are always looking to bring new innovative items to our catalog so contact our Customer Service department with any suggestions you may have! We are constantly expanding our product selection to better serve your needs. Occasionally a warehouse is out of the product and the warehouse further from you will have to fulfill the order which could make the ETA up to 6 days. To ensure your package reaches its intended location. And you will be able to redirect your package(s). For items that are defective or damaged, Aosom may require pictures to help us determine the appropriate next step, which may be replacement parts, or a replacement unit. In this day and age, we understand peoples time is valuable, so supplying pictures when you message us will help us assist you faster. Add a map to your own listings. 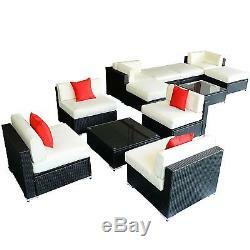 The item "12PC Rattan Wicker Sofa Set Outdoor Patio Furniture Sectional Garden Aluminum" is in sale since Tuesday, February 11, 2014. This item is in the category "Home & Garden\Yard, Garden & Outdoor Living\Patio & Garden Furniture\Patio & Garden Furniture Sets". The seller is "dauntlessdeals" and is located in Lake Oswego, Oregon. This item can be shipped to United States.